HERE, based on November's Festival at the Palo Alto JCC. If you were there, you might see yourself! 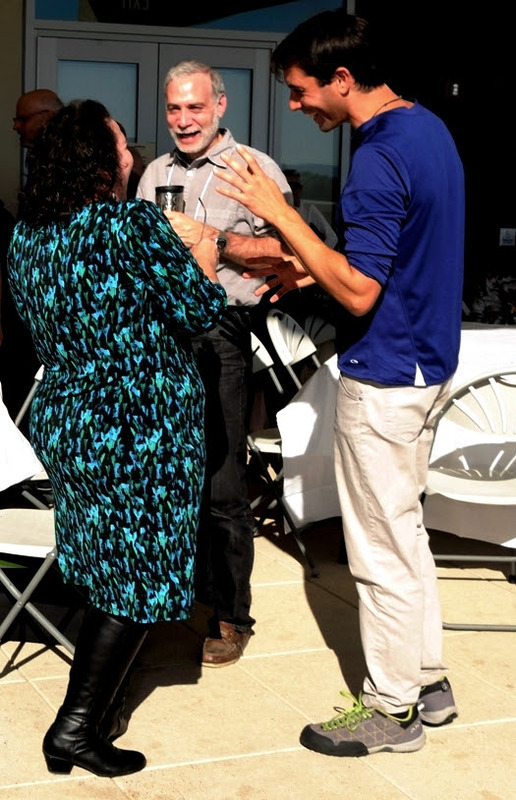 If you were not there, see the fun you missed and come to our next Festival in Fall, 2015. Images from video by Chip Curry with Diana Roberts, Chrysalis Films. KlezCalifornia's Contributing Members (i.e. donors) are warmly invited to our semi-annual party with Board and Advisory Council members, Sunday, March 15, 2:00-5:00pm at a private home in Oakland. 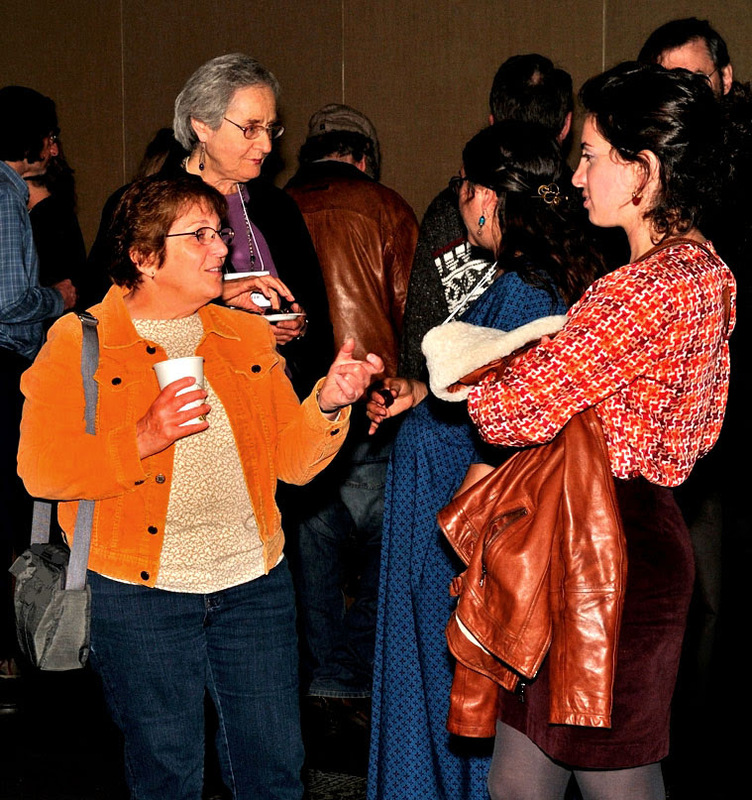 Just like our Festival in these photos, the event will be filled with shmoozing, food, and Yiddish culture. Donors can expect to receive invitations in mid-February. If you would like an invitation but have not contributed since January 2014, we invite you to make a donation right now HERE. Festival still photos by Lea Delson, delsonphoto.com. -- Submissions for the March newsletter HERE by February 20. Thursday, February 12, 6:00-7:30pm, The Holocaust in Every Tongue: Which "Night" is Right: Yiddish, French or English and the Politics of Translation, with Naomi Seidman. The events of the Holocaust reached the worldwide audience largely in translation, in languages different from the one of the victims, or in which the events transpired. The term "Holocaust" is itself, not coincidentally, taken from the Septuagint, the Greek translation of the Bible. What is the role of translation in the transmission of Jewish memory? How does this Jewish catastrophe mean differently to different audiences, far removed in culture, time, and place from World War II-era Europe? Why is the translational nature of Holocaust memory so often neglected? This talk will focus on both the larger question of the role of translation in Holocaust discourse and the particular role played by translation in Elie Wiesel's "Night." Howard Simon will open the program by speaking from an American Jew's viewpoint of Buchenwald through the lens of Primo Levi. This lecture is presented by Lehrhaus Judaica in conjunction with the exhibition "Alive! A la vie!" on the Children of Buchenwald. The photographic panels look at life before the Holocaust, ghettos and life during the war, the Buchenwald camp, and life after the war. Please arrive early to guarantee a seat as space is limited. Co-sponsored by KlezCalifornia. More info: 510.845.6420, HERE. Di Megileh of Itzik Manger. 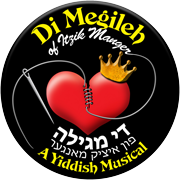 The New Yiddish Theater company reprises last year's sold-out run of the hit Yiddish musical (fully super-titled in English) based on the Book of Esther poems by Itzik Manger, with music by Israeli composer Dov Seltzer, and new choral arrangements by Veretski Pass' Josh Horowitz. With one foot in 1930s Eastern Europe and the other in biblical Persia, Di Megileh recounts the Book of Esther through the eyes of Esther's jilted lover, Fastrigoseh the tailor. The New Yiddish Theater is a fiscally-sponsored project of KlezCalifornia. Tickets: $30 general / $25 JCC East Bay members, seniors, students. Matinee only: $15 general / $12 JCC East Bay members, seniors, students. More info: 510.848.0237 X126.Tickets:800.838.3006, HERE. Saturday, February 7, 10:30am-12:30pm and Sunday, February 8, 3:00-5:00pm, Yiddish Folk Song Workshops with Ethel Raim. Workshops on unaccompanied Yiddish folksong, with material drawn from the repertoires of traditional East European-born singers. Raim will teach primarily lyric love songs, the kind young girls learned from their mothers, aunts and older sisters in pre-WW II Eastern Europe. She will emphasize vocal style, ornamentation and pronunciation, and assist participants to hone their singing style and authentic expression. These workshops are for participants who are musically and linguistically prepared to really dig into the unaccompanied Yiddish folksong repertoire and style. They are open to all, but familiarity with Yiddish is recommended. The two workshops will feature different material. Raim is a leading performer and teacher of the unaccompanied women's Yiddish and Balkan folksong traditions. She has taught Yiddish singing at KlezKamp, KlezKanada, Yiddish Summer Weimar, and New York University's Tisch School of the Arts; is co-founder and Artistic Director of New York's Center for Traditional Music and Dance, co-founded and was musical director of the Pennywhistlers, and served as Music Editor of Sing Out! Magazine. Tickets: $30 per workshop. Registration for Saturday: HERE. Registration for Sunday:HERE. More info: 510.444.0323, kitka.org. Sunday, February 8, 9:00-11:00am, Discussion of stories by Zalman Shneour and Edna Ferber, with Rabbi Janet Marder and Dr. Joyce Penn Moser. Part two of five-session Explorations in Modern Jewish Literature on works by American, European and Israeli Jewish writers. Suggested donation: $36 for the series (includes bagels, cream cheese, juice, and coffee). More info:650.493.4661, HERE. minimum $10 purchase. More info: 510.848.3354, HERE. Tuesday, February 17, 7:00pm, The Sturgeon Queens (film). Tickets: series of 4 films for $36 / drop in: $12 per film. More info: 415.444.8000, HERE. Friday, February 20, Sunday, March 1 (six performances), Fiddler on the Roof. Presented by Youth Musical Theater Company. Tickets: $15-$28. More info: HERE. Saturday, February 21, 8:00 pm, To Everything There Is A Season, with Cantor Sharon Bernstein, and Carolyn Reiser, Karen Segal, Judy Graboyes. International songs (including Yiddish) about day and night, weather, and food. Tickets: $10 members / $15 non-members. More info: 415.861.6932,shaarzahav.org. Sunday, February 22, 1:00pm, Family History of Klezmer Music, with Gerry Tenney. Part of regular meeting of San Francisco Jewish Genealogical Society. A history of klezmer music, through early and modern recordings and live performance. Gerry will also discuss his family's relationship to the klezmer tradition. No charge. More info: HERE. Sunday, February 22nd, 3:00pm, Mir Zingen: A Musical Tribute to the Jewish Chicken Ranchers of Petaluma, with the San Francisco Jewish Folk Chorus. In celebration of 150 years of Jewish life in Petaluma. No charge. More info: 707.762.0340, bnaiisrael.net. Mondays, Feb. 23, March 2, 9, and 16, 2:00-4:00pm, Yiddish Writing in Translation: Jews in a Hostile World, led by Loretta Denner. The class will include three genres of writing: a drama by Sholem Asch ("God of Vengeance"), two short stories, and three poems. No charge, but donations to the JCC are welcome. More info and reading list: lorluba[at]aol.com. 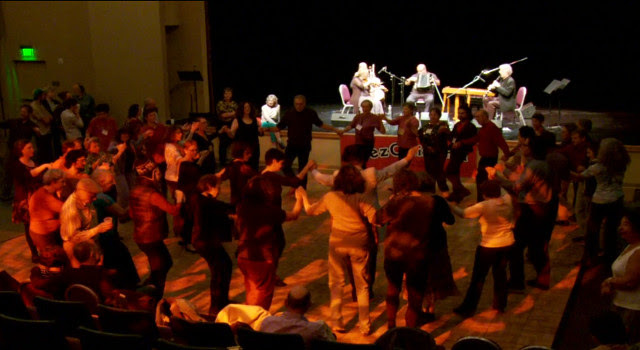 Wednesday, February 25, Klezmer Night, 7:00pm performance by Klezmer Creek, jam at7:30pm. Free with minimum $5 purchase. More info: 707.544.2491, klezmercreek.com,gaiasgardenonline.com. Thursday, February 26, 5:30-8:00pm, The Gonifs. Part of opening reception for two exhibitions: "Letters to Afar," and "Poland and Palestine: Two Lands and Two Skies" (see below). Presentations at 6:00pm, 6:30pm; music performances before and between speakers. Limited seating; reservations required. Tickets: General $10 / Members free. More info: 415.655.7881, HERE. Thursday, February 26 - Sunday, May 24, Letters to Afar (video installation). Budapest-based filmmaker and video-artist Péter Forgács, along with The Klezmatics, revisit amateur movies made by Jewish immigrants from the U.S. who visited their hometowns in Poland during the 1920-30s. Forgács rewrites these "visual postcards." Tickets: Included in museum admission ($12 general / $10 seniors, students / $5 Thursdays after 5:00pm / no charge 18 and under). More info: 415.655.7800, HERE. Thursday, February 26 - Sunday, May 24, Poland and Palestine: Two Lands and Two Skies(exhibition). Portraits made in the 1930s by photographer Ze'ev Aleksandrowicz, which show their subjects in the streets of Kraków and in distant Palestine. The photographs become the starting point for telling stories about the relationship between these two worlds, full of contrasts and contradictions. Tickets: Included in museum admission. More info: 415.655.7800, HERE. U.S. Army Field Band performs in Yiddish in Tel Aviv HERE. Yes, we know it's a Khanikeh(Hanukkah) song, but you won't want to have waited almost a whole year to hear this! Calling all Yiddish speakers on the Peninsula: We reviving the Yiddish Salon on the Peninsula! As before, it will be for Yiddish speakers at all levels. 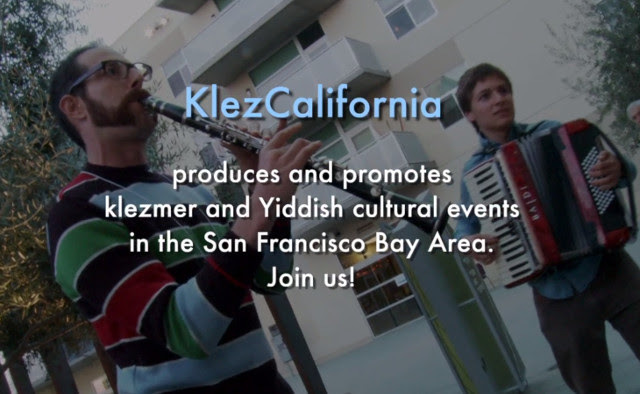 If you are interested, please contact 415.789.7679,peninsula[at]klezcalifornia.org. Proverb of the month: If the cat laid eggs, it would be a hen (Di kats zol leygn eyer, volt zi geven a hun). Yiddish phrase of the month: Darfn af kapores, have no use for. Listen to Theodore Bikel sing"Kum Aher, Du Filozof" HERE and find the phrase (Thanks to Gerry Tenney). Monday, March 2, 6:00-8:00pm, Glenn Hartman & the Klezmer Playboys. Part of Klezmer Mondays. Entertainment free with minimum $10 purchase. More info: HERE. Thursday, March 5, 8:00pm, The Klezmatics. Opening night of Jewish Music Festival. Tickets: $30 general / $26 students, seniors, JCC members. More info: 510.848.0237 X126. To buy tickets: 800.838.3006, jewishmusicfestival.org. Friday, March 6, 1:00-2:30pm, Talk by Frank London. Klezmatics' bandleader and "Letters to Afar" video installation collaborator, Frank London talks about the creation of the exhibition's music and his own Jewish and musical journey. Tickets: Free with museum admission. More info: 415.655.7800,HERE. Sunday, March 8, 2:00-4:00pm, The Language Wars, with Shaina Hammerman. Most twenty-first century Jews are being raised to speak a single language, but multilingualism colors the Jewish experience in the diaspora. Battles once raged between German and Yiddish, Yiddish and Hebrew, Judeo-Arabic and French, Hebrew and Ladino, Yiddish and English, among others. No charge. More info: HERE. Monday, March 9, 6:00-8:00pm, Ghost Note Ensemble. Part of Klezmer Mondays. Entertainment free with minimum $10 purchase. More info: HERE. Tuesday, March 10, 2:40pm, When Jews Were Funny (film), Part of East Bay International Jewish Film Festival, March 7-15. Tickets: $9 advance / $10 door. More info: 510.809.4919,eastbayjewishfilm.org. Wednesday, March 11, 12:30pm, Theodore Bikel: In the Shoes of Sholem Aleichem (film). 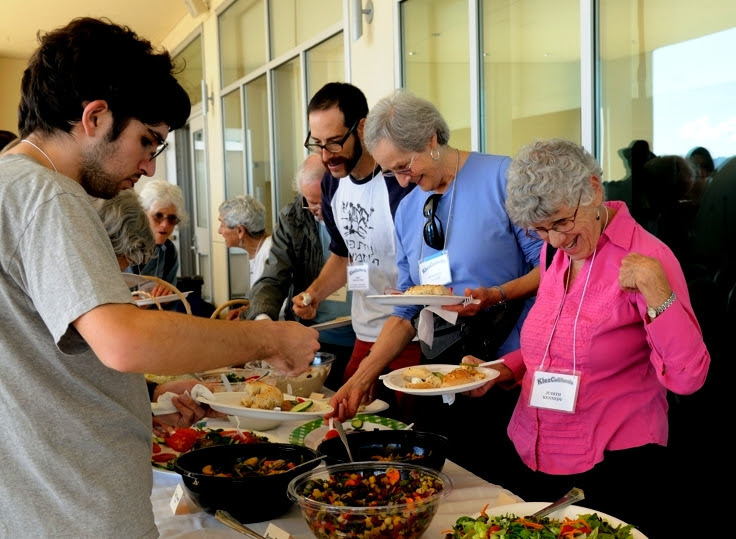 Part of East Bay International Jewish Film Festival, March 7-15. Tickets: $9 advance / $10 door. More info:510.809.4919, eastbayjewishfilm.org. Thursday, March 12, 12:30pm, Mr. Kaplan (film), with klezmer music score. Part of East Bay International Jewish Film Festival, March 7-15. Tickets: $9 advance / $10 door. More info:510.809.4919, eastbayjewishfilm.org. Sunday, March 15, 2:00-5:00pm, KlezCalifornia Spring Party. For Contributing Members, i.e. donors at all levels. More info and rsvp: 415.789.7679, info[at]klezcalifornia.org. Tuesday, March 17, Wednesday, March 18, and Thursday, March 19, 7:30pm, three different Yiddish Dance Workshops, with Steve Weintraub. Part of Jewish Music Festival. Tickets: $15 per workshop, $25 for two, $40 for all three. More info: 510.848.0237 X126, HERE. To buy tickets:800.838.3006, jewishmusicfestival.org. adults / $12 children, seniors, students / $19 NTC members. More info: 415.883.4498, HERE. Sunday, March 29, KlezCalifornia Flisik Yidisheh Salon. For fluent Yiddish speakers. No charge. More info: 415.789.7679, flisik[at]klezcalifornia.org. Monday, March 30, 6:00-8:00pm, Ben Goldberg & Rob Reich. Part of Klezmer Mondays. Entertainment free with minimum $10 purchase. More info: HERE. Elaine Moise & Bob Grodsky: In memory of Lilian Grodsky. Karen Bergen, Director of Yiddish Choristers, in memory of founder Lotte Solomon: Lotte Solomon remembered as a child listening to records with her music-loving father, everything from classical to cantorial music. As an adult, Lotte -- Yiddishist and violinist -- had a great idea in the 1980s. She started a choral group in the South Peninsula dedicated to performing Yiddish music. The ALS JCC housed the group, eventually known as "The Yiddish Choristers." Soon the group was listed in the chorus section of the Foothill Community College catalog. Small klezmer groups eventually performed as part of the Choristers. A new director now continues the excellent tradition that Lotte started. Rosie Kaplan: In memory of Fanny, Benny and Harry Kaplan, who loved Yidishkayt, its music, humor and food!! !